Edmonton Oilers forward Taylor Hall (4) and Tampa Bay Lightning forward Martin St. Louis (26) battle for a loose puck during the second period. EDMONTON, Alberta (AP) — Jordan Eberle scored two goals, and the Edmonton Oilers snapped a four-game losing streak with a 5-3 victory over the Tampa Bay Lightning on Sunday night. Taylor Hall, Luke Gazdic, and Boyd Gordon also scored for the Oilers (14-26-5), who have won three of 13. Edmonton avoided its fourth five-game losing streak of the season. It was the Oilers’ first win against a team above the playoff cutline in a month. Nikita Kucherov, Victor Hedman and Valtteri Filppula had goals for the Lightning (25-13-4), whose five-game winning streak on the road ended. Tampa Bay took a 1-0 lead with a power-play goal 2:43 into the game. Matthew Carle made a cross-ice pass to Kucherov at the left faceoff dot, and Kucherov beat goalie Ilya Bryzgalov with a quick shot glove-side. Edmonton tied it 1:35 later when a stick got caught in the skates of Lightning forward Martin St. Louis in front of the Tampa Bay net. Eberle fished it out and lifted his 13th goal of the season past goalie Ben Bishop. Bishop left the game after the play because of an injury to his right hand. Anders Lindback came in to replace him just as Alex Killorn took a double minor for high-sticking. Edmonton went ahead 2-1 during the first half of the advantage on their second shot of the game at 6:09. Eberle’s shot pinballed in front and was deflected past Lindback by defender Sami Salo. It was Eberle’s second goal in less than two minutes after he netted only one in his previous 11 games. The Oilers took a two-goal lead with 4:18 left in the first period. A Lightning giveaway behind their net eventually allowed Gazdic to tip his second career goal past Lindback off a point shot from Justin Schultz. The Lightning gained momentum in the second when Hedman scored his eighth of the season at 8:47. 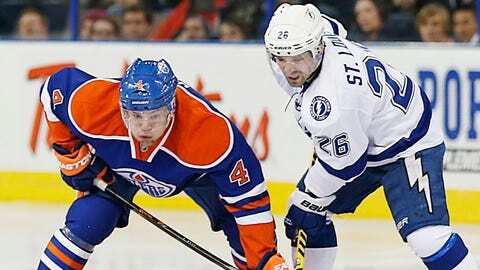 Hedman scored with a screened shot after Tampa Bay stole the puck at the Oilers’ blue line. Tampa Bay tied it 3-3 with 5:35 remaining in the second when Filppula scored his 16th goal with a quick wrist shot. Lindback kept the Oilers from regaining any momentum on a late second period power play, making stops on Eberle and Gordon. Both teams hit posts early in the third period, including one by Edmonton’s Ales Hemsky that prompted the goal judge to turn on the red light before a video review determined the puck didn’t go in. Edmonton took a 4-3 lead at 8:20 when Gordon fought off a defender and swatted in the rebound from his own backhand for his second goal in two games. The Oilers went up by two goals with 9:30 remaining when the teams were playing 4 on 4. Hall made a perfect redirection of Andrew Ference’s point shot for his 16th goal and team-leading 41st point. NOTES: The teams split the two-game season series. … Tampa Bay forward Steven Stamkos (broken right tibia) has begun skating in full gear but isn’t ready to play. The Lightning are 13-8-4 without the star center. … Bishop was 8-0-2 in his previous 10 games, allowing two goals or fewer in eight consecutive starts and in 26 of 31. … Lightning D Sami Salo returned to the lineup after sitting out four games due to an upper-body injury. … Eberle was back after a one-game absence because of a knee injury. Defensemen Corey Potter (groin) and Philip Larsen (illness) are on the Oilers’ injured list.